My weekend started shakily this am. I turned on my televison to watch the first draw of the Tim Horton’s Brier (the Canadian Men’s Curling Championship) and sadly discovered that my power was out. %$&*! But get this, my power was out only in my living room where my TV is located. The anti-curling gods were out to get me. 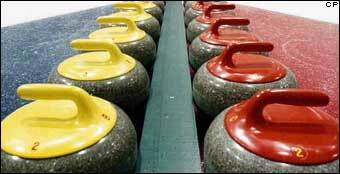 Either that, or my “friends” have taken action to subsume my curling addiction. Fortunately, the curling Gods came to my rescue and power was successfully restored during the 4th end of the Alberta vs. BC game broadcast. Phew! If I had to wait much longer I would have composed a very angry letter to Enmax demanding that if they couldn’t restore my power STAT they had better put me on a plane to Hamilton, Ontario to watch the bonspiel live. It was for your own good.